Saturday 17th Ridge – was working! 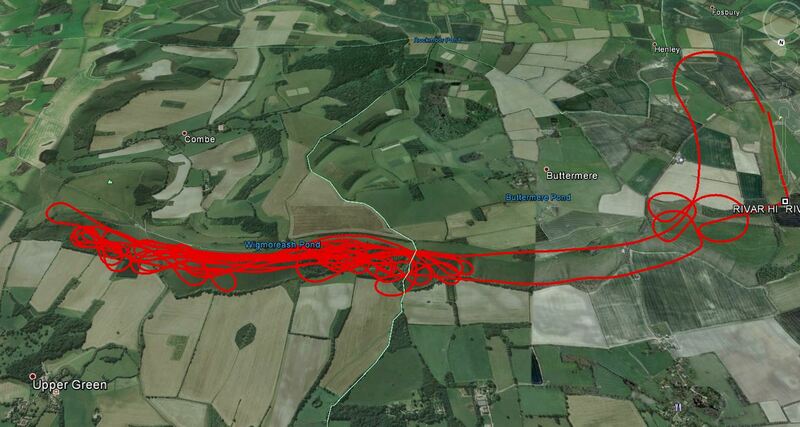 Home » Flying Reports » Saturday 17th Ridge – was working! With the forecasted NE wind Carol and I felt the need to rig the Janus to see if the ridge was working and with only about 10-12 knots at 020 we were a little sceptical but it was worth a try. The ridge was working but the lift was being broken up by thermal activity which made it quite interesting in places. As the day went by the thermal influence subsided and the ridge gradually started working better. Our flight times were 23mins, 35mins and finally 44mins, here is an overlay of our last flight which was mostly between 900ft and 700ft QFE. We were both surprised that the ridge was actually working in such light conditions and even though some of the time we were low and a fair way away from the club the lift was (luckily for us) consistent.